We’ve made a kind of a name for ourselves as far as living debt free goes – and teaching other people how to make it a real thing in their own lives. Barry does a lot of work with people on the side trying to help them live debt free as well. Our whole debt free story is available both on the Humorous Homemaking and on Facebook under videos. 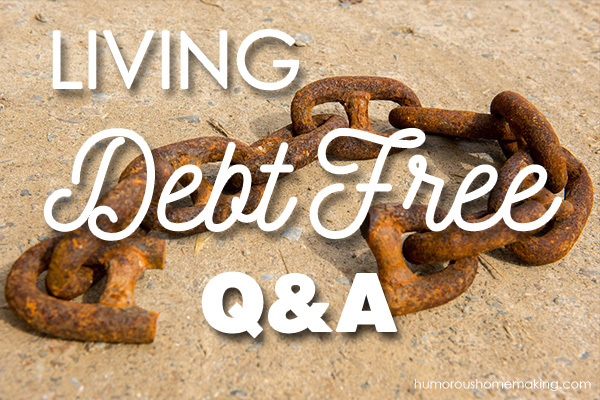 But recently we asked if y’all had any specific questions related to living debt free and decided to answer them today in kind of a speed Q&A round. 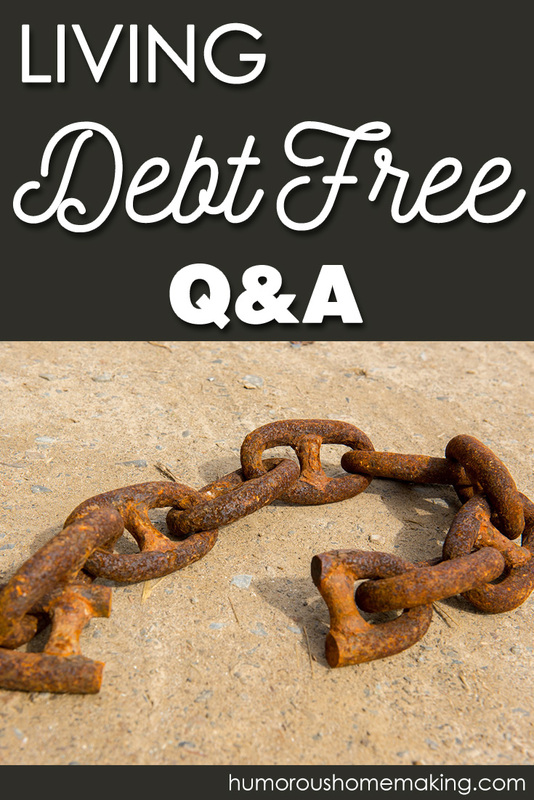 So, first question: Why are we living debt-free? Stacy: We live debt-free because we believe that is what the Bible tells us to do. When the Bible says that the borrower is slave to the lender, we believe it means that! We don’t want to serve any other master but Jesus. We believe the Bible calls us to live generously. Barry: If you’re not a Christian and want a “non-Bible” answer, understand this: debt equals risk. It always does! Everyone will have SOME, but I don’t want any unnecessary risk that I don’t have to have. That’s another important reason to live debt-free. Janet asked: How has life becoming more “online” changed your budgeting/envelope system? Stacy: We still do a budget every single month. But since I do buy a lot of things online, a lot of our cash budget technically stays in our account. If I spend something online I take it out of that cash envelope and put the cash back in our bank account. We have thrown around the idea of NOT having cash in our house, but we keep deciding against it! Because we’ve always had cash envelopes, it’s just easier for us! Barry: We don’t believe that everyone needs to do a cash budget, but we do know (statistics show!) that people who pay with a card are more likely to overspend. Handing over a $50 bill is way different than sliding a plastic card across the counter! Stacy: If you’re in a committed relationship and you both care for each other, asking hard questions might seem scary, but it usually turns out okay! Barry: You might not like this answer, but I don’t care about your credit score. It’s based on your ability to pay off your debt. Credit history (if its bad) is a reflection of some poor decisions, but it’s not the only factor to consider. A better discussion is deeper – about how you both feel about money. You should discuss saving, spending, debt, and finances. Money is a really important thing – it’s a tangible and visible way to show what’s important to you. If your relationship is going down a serious path, you need to make sure you are both on the same page about how to handle your money. Stacy: Always remember, it’s not his and yours – it’s ours. When you’re married, you need to make financial decisions together. Barry: Yes, but it’s good that both of you both have different perspectives financially. That makes for a better team. And it’s important to have “fun” money in your budget for him to play with! You need to sit down and agree to a budget, but one of the categories should be a miscellaneous fund. This will help him not feel so restrictive. You weren’t born just to pay bills and die. And example we use often: A cattle farmer puts up fences in the field. He doesn’t care where the cows go as long as they stay inside the fence. Your budget is your fence, but how you decide to spend your income is based on your preferences, needs, and what matters most to you and your husband. Stacy: The short answer is: you get help! LOL. We have an investment advisor that helps us. Barry: You and your spouse get the pleasure of deciding where and how to save and spend. You still need to account to spend monthly for utilities, insurance, gas, food, etc. But like Stacy said, get some guidance on investing! You want to invest/save, give generously, and find ways to spend your money that bring joy to you and those around you. Stacy: Look at how much it would cost you per month if you were not on grocery budget, but you were buying only what your family needs to eat. What would it realistically look like if you bought everything you needed for your family? Food is no longer something that we skimp on! For health reasons, we don’t buy cheap food – we buy healthy ingredients and real, WHOLE foods. Sometimes, I don’t get things I want, but our budget covers everything we need, because food is really important to me! Barry: I’m going to answer the question you aren’t asking here. There is a really easy math formula for personal finance: INCOME – SAVINGS – EXPENSES = 0. Look at all the expenses you have – not just the ones that are obvious! If you’ve already cut your bills to the bare minimum, then yes, you might need to look at how you can earn more income. One last thought about living debt free, and that’s the idea of remembering where it all comes from and maintaining a generous and thankful spirit with your finances. Stacy: We believe that if you dedicate your finances to the Lord and say with your whole heart,” Lord I’m doing this!” that he really blesses that income! We are huge advocates for tithing. Everything that we made, we give 10%. Barry: Whether you believe in tithing or not – giving is important! Holding money with an open hand isn’t easy…you can’t hold on to it forever. But it’s also important to remember that you can’t receive any more blessings if you’ve got a closed fist! When we pursued getting out of debt – that was all we did! We didn’t focus on our retirement or saving for college funds – we focused fully on getting rid of our debt! We weren’t making tons of money or inherited a bunch of money… we made the decision that debt was not for us – we just made it happen. We became debt-free in 2011. And thanks to a continued focus on sticking to our budget, we’ve stayed that way. And we want your family to experience the same freedom that comes from being slave to no man. Please reach out to Barry or me if we can help your family achieve your goals!